Two weekends ago we installed the exterior windows and doors. I had them manufactured by Bonneville, ordered of course through Dale's Home Hardware Building Centre in Otter Lake. The windows are great! Terrific quality at a reasonable price. Installing windows is at least a two-person job, and if the windows are big, like ours, then consider three people to do it! Fit your wall thickness: Our stud walls are nominally 2x6, hence 5 1/2 inches, but to do it right you need to take into consideration other building material that affect the thickness of the finished wall. for instance the exterior sheathing is 1/2 inch and the drywall on the inside is another 1/2 inch. If you are putting lath on the outside to separate your siding from the wall then you need to add about 3/4 inch more. The whole purpose of getting the right thinkness of window is to make it easy to finish on the inside. Witht he window structure ending flush with the drywall on the inside installing the finish is just a simple nail on affair! 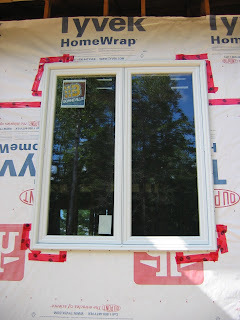 Add a Nailing Flange: An option to consider is adding a nailing flange on the outside of the window. This again is added in the manufacturing process. In makes installing the windows extremely easy. You still have to shim the windows but all the securing is done by using screws from the outside of the window. No blemishes on the inside of the windows. Add Factory Brick Moulding: We are installing vinyl siding, hence, we added the brick moulding feature. This eliminated the added step (and a whole lot of time) in installing J-trim around a window to hold in the ends of the horizontal siding. In essence, it has the j-trim already built-in. Get 100 % Vinyl: Our goal is a near maintenance free Cottage. I have no interest in painting windows every 5-years. Plus the vinyl is all seamless so there is less chance of leaks - they actually melt the corners of the windows together! Energy Conservation: Go for as much energy conservation in the windows as you can afford. Windows are one item you can't update without replacing them and the incremental cost is peanuts. We added low-E and argon. Low-E adds a coting to reflect those bad UV rays and argon provide better insulation value. BTW: just about all of these apply to the external doors as well.